Two large pockets for nails, screws and tools. Canvas waist ties, double stitched for extra strength. One size fits all. Carefully manufactured for sound, solid connections and trouble-free service. Easily crimped or swaged. Made from electrolytic copper rated for 100% conductivity. Carded 2-pack. Carefully manufactured for sound, solid connections and trouble-free service. Easily crimped or swaged. Made from electrolytic copper rated for 100% conductivity. Carded 2-pack. Carefully manufactured for sound, solid connections and trouble-free service. Easily crimped or swaged. Made from electrolytic copper rated for 100% conductivity. Carded 2-pack. Carefully manufactured for sound, solid connections and trouble-free service. Easily crimped or swaged. Made from electrolytic copper rated for 100% conductivity. Carded 2-pack. Heavy-duty cotton canvas. Pockets for tools, pencils and parts. Machine washable, 2 polypropylene hammer loops. One size fits most. Quick-release buckle. 2" wide belt. Carefully manufactured for sound, solid connections and trouble-free service. Easily crimped or swaged. Made from electrolytic copper rated for 100% conductivity. Carded 2-pack. Carefully manufactured for sound, solid connections and trouble-free service. Easily crimped or swaged. Made from electrolytic copper rated for 100% conductivity. Carded 2-pack. Carefully manufactured for sound, solid connections and trouble-free service. Easily crimped or swaged. Made from electrolytic copper rated for 100% conductivity. Carded 2-pack. E6013 an all-position, general purpose rod with medium to shallow penetration; medium to heavy slag is easily removed; excellent for poorly fitted joints; smaller sizes of rod are well suited to low heat on thin metals; use on all types of mild steel where ease of operation and good appearance is required; great for light gauge metal, sheet metal, duct work, etc. Recommended Polarity: AC, DCEP, DCEN (Either Polarity). Tensile Strength (PSI): 83,000. Amperage: 50-70 on sku # (890.9806) the Amperage is 30-50. E7018 mild steel welding rod easily produce quality results on smaller amperage AC/DC welders; suitable for all positions on harden steels where no preheat is used and on cold rolled steels normally exhibiting excessive porosity when welded with conventional rod; the low hydrogen content reduces cracking and peeling of the weld material; features excellent restart capability; designed for welding low, medium and high carbon steels as well as some higher strength low alloy steel; for frames, trailer hitches and chassis. Recommended Polarity: AC, DCEN, DCEP (Reverse). Tensile Strength (PSI): 84,000. Amperage: 100-140 on sku #s (890.9624, 890.9632) Amperage: 140-190. Army pistol-type construction, 2-1/4" wide. Two bib pad and pencil pockets, 1 waist pocket, overall length 36". Machine washable . One size fits most. Durable clip hangs on toolbelts, belt loops etc. Carry and organize all miscellaneous parts, tools and accessories. 3 convenient sizes: 9" x 7", 7" x 6" and 6" x 5". E6013 an all-position, general purpose rod with medium to shallow penetration; medium to heavy slag is easily removed; excellent for poorly fitted joints; smaller sizes of rod are well suited to low heat on thin metals; use on all types of mild steel where ease of operation and good appearance is required; great for light gauge metal, sheet metal, duct work, etc. Recommended Polarity: AC, DCEP, DCEN (Either Polarity). Tensile Strength (PSI): 83,000. Amperage: 50-70 on sku # (890.9806) the Amperage is 30-50. Made of 600 poly ripstop fabric. Web loop for tape rolls. Cell phone pocket fits iPhone? 6. Made of 600 poly ripstop fabric. Holds small tools, pencils, flashlights and more. Size: 5 in. W x 2 in. D x 9 in. Mesh windows. Assorted sizes and colors. Brown: 5.7 in. W x 4.8 in. H. Gray: 6.7 in. W. x 5.7 in. H. Black: 8.7 in. W x 6.7 in. H. 1-3/4" Embossed top grain leather, steel single tongue buckle. General purpose rod with medium to shallow penetration. Medium to heavy slag is easily removed. Excellent for poorly fitted joints. Smaller sizes of rod are well suited to low heat on thin metals. Use on all types of mild steel. Great for light gauge metal, sheet metal, duct work, etc. Recommended Polarity: AC, DCEP, DCEN (Either Polarity). Tensile Strength (PSI): 83,000 Amperage: 70-110. No.10 canvas bag with strong zipper; convenient storage for pliers, wrenches and other tools. 18 oz. Duckwear canvas; quick release belt fits up to 52" waists; 13 pockets to hold tools and pens; bar tacked seams. Size: 23" W x 9.5" H; 27" to 54" waist size. Formulated for high tensile strength and ductility. Smooth flowing. Excellent for most brazing uses. Flux coated for best cleaning action. Yellow color coded. Tensile Strength: 65,000 PSI. Melting Point: 1,598? F (870? C). Ideal for staying organized. It can hold utility knives, small flashlights and markers. It's made to last with heavy duty poly ripstop material. It features FlapFit?, a padded flap that easily attaches over a belt without removing it or in a pants pocket. 4 pockets and one padded pocket to fit most compact cell phones; attach to belt with snap closure or carry securely in pocket with wide padded flap; webbing slot for small flashlights or other tools; electrical tape sling and made of polyester fabric. E6011 an all-position rod with strong arc force for deep penetration; fast metal solidification facilitates welding in vertical and overhead positions; light slag allows for easy clean-up; excellent for rusty steel because of the strong arc force; useful for galvanized tanks, steel casting and pressure pipe. Recommended polarity: AC, DCEP, DCEN (Either Polarity). Tensile Strength (PSI): 88,000. Amperage: 25-75 on sku #s (890.9665, 890.9673, 890.9681) Amperage: 35-125 on sku #s (890.9707, 890.9715, 890.9723) Amperage: 50-160. Made of Poly Rip Stop/600D poly material. Has 9 pockets and 8 tool loops. Flap fits inside pants pocket or over the belt. Has a clip for tape measure, tools and keys. Has web loop for tape rolls. E7018 mild steel welding rod easily produce quality results on smaller amperage AC/DC welders; suitable for all positions on harden steels where no preheat is used and on cold rolled steels normally exhibiting excessive porosity when welded with conventional rod; the low hydrogen content reduces cracking and peeling of the weld material; features excellent restart capability; designed for welding low, medium and high carbon steels as well as some higher strength low alloy steel; for frames, trailer hitches and chassis. Recommended Polarity: AC, DCEN, DCEP (Reverse). Tensile Strength (PSI): 84,000. Amperage: 100-140 on sku #s (890.9624, 890.9632) Amperage: 140-190. E6011 an all-position rod with strong arc force for deep penetration; fast metal solidification facilitates welding in vertical and overhead positions; light slag allows for easy clean-up; excellent for rusty steel because of the strong arc force; useful for galvanized tanks, steel casting and pressure pipe. Recommended polarity: AC, DCEP, DCEN (Either Polarity). Tensile Strength (PSI): 88,000. Amperage: 25-75 on sku #s (890.9665, 890.9673, 890.9681) Amperage: 35-125 on sku #s (890.9707, 890.9715, 890.9723) Amperage: 50-160. E7018 mild steel welding rod easily produce quality results on smaller amperage AC/DC welders; suitable for all positions on harden steels where no preheat is used and on cold rolled steels normally exhibiting excessive porosity when welded with conventional rod; the low hydrogen content reduces cracking and peeling of the weld material; features excellent restart capability; designed for welding low, medium and high carbon steels as well as some higher strength low alloy steel; for frames, trailer hitches and chassis. Recommended Polarity: AC, DCEN, DCEP (Reverse). Tensile Strength (PSI): 84,000. Amperage: 100-140 on sku #s (890.9624, 890.9632) Amperage: 140-190. Nomacast hard cast iron features a non-conductive coating; great for welding dirty, heat affected and oxidized cast iron; ideally suited to cladding contaminated casting prior to joining with high nickel alloys; non-machinable; RC 39 hardness. E6011 an all-position rod with strong arc force for deep penetration; fast metal solidification facilitates welding in vertical and overhead positions; light slag allows for easy clean-up; excellent for rusty steel because of the strong arc force; useful for galvanized tanks, steel casting and pressure pipe. Recommended polarity: AC, DCEP, DCEN (Either Polarity). Tensile Strength (PSI): 88,000. Amperage: 25-75 on sku #s (890.9665, 890.9673, 890.9681) Amperage: 35-125 on sku #s (890.9707, 890.9715, 890.9723) Amperage: 50-160. For #2 thru #6 welding cable. Cable splicer for permanently splicing damaged or broken cables and adding additional cable length to existing welding cable leads. Heavy duty suede leather. Large capacity nail/tool pocket. Fits belts up to 2-3/4" wide. E6013 an all-position, general purpose rod with medium to shallow penetration; medium to heavy slag is easily removed; excellent for poorly fitted joints; smaller sizes of rod are well suited to low heat on thin metals; use on all types of mild steel where ease of operation and good appearance is required; great for light gauge metal, sheet metal, duct work, etc. Recommended Polarity: AC, DCEP, DCEN (Either Polarity). Tensile Strength (PSI): 83,000. Amperage: 50-70 on sku # (890.9806) the Amperage is 30-50. E7018 AC mild steel welding rod easily produce quality results on smaller amperage AC/DC welders; suitable for all positions on hardened steels where no preheat is used and on cold rolled steels normally exhibiting excessive porosity when welded with conventional rod; the low hydrogen content reduces cracking and peeling of the weld material; features excellent restart capability; designed for welding low, medium and high carbon steels as well as some higher strength low alloy steel; for frames, trailer hitches and chassis. Recommended Polarity: AC, DCEN, DCEP (Either Polarity). Tensile Strength (PSI): 84,000. Amperage: 65-100 on the 10 LB rods 140-190. Individual electrode (rod) weighs .50 lbs (.75 oz). E7018 mild steel welding rod easily produce quality results on smaller amperage AC/DC welders; suitable for all positions on harden steels where no preheat is used and on cold rolled steels normally exhibiting excessive porosity when welded with conventional rod; the low hydrogen content reduces cracking and peeling of the weld material; features excellent restart capability; designed for welding low, medium and high carbon steels as well as some higher strength low alloy steel; for frames, trailer hitches and chassis. Recommended Polarity: AC, DCEN, DCEP (Reverse). Tensile Strength (PSI): 84,000. Amperage: 100-140 on sku #s (890.9624, 890.9632) Amperage: 140-190. E7018 AC mild steel welding rod easily produce quality results on smaller amperage AC/DC welders; suitable for all positions on hardened steels where no preheat is used and on cold rolled steels normally exhibiting excessive porosity when welded with conventional rod; the low hydrogen content reduces cracking and peeling of the weld material; features excellent restart capability; designed for welding low, medium and high carbon steels as well as some higher strength low alloy steel; for frames, trailer hitches and chassis. Recommended Polarity: AC, DCEN, DCEP (Either Polarity). Tensile Strength (PSI): 84,000. Amperage: 65-100 on the 10 LB rods 140-190. Individual electrode (rod) weighs .50 lbs (.75 oz). Heavy-duty double layer lightweight fabric will not rot, crack, harden or mildew. Foam padding, 2" Double tongue metal roller buckle. Grip Strip fastening system hold pouches securely in place. Heavy-duty poly fabric construction provides strength and durability. Pouch has a rear flap that slips into back pocket or snap closure to attach to two inch wide belt. It has a large main pocket, the padded cell phone holder has hook and loop flap closure to help secure phone, web loops and sleeve pockets provide multiple storage options. The outside web loop is for a small flashlight or tool, tape strap plus an extra hidden pocket. Flap fit back fits inside pants pocket or over the belt. Made of Poly Ripstop/600D poly material. 4 inch notebook pocket, tape measure clips and 4 open bottom pockets for long tools. Made of polyester fabric and ballistic nylon binding. Two main nail and tool pockets; 6 smaller pockets for pencils, nail sets, etc. Steel hammer holders. May be worn on left or right side. Fits belts up to 2-3/4" wide. Heavy duty suede leather. 2 Main nail/tool pockets; 6 Smaller pockets fit pliers, nail sets, pencils.. 2 steel hammer loops. Fits belts up to 2-3/4" wide. 18 oz. Duckwear canvas; full coverage apron for home or shop; quick release belt that fits up to 52" waists; 16 pockets: 13 on waist, 3 on bib; padded shoulder straps, dual hammer loops. Size: 23" W x 23.5" H. Made of heavy-duty Duckwear canvas. Padded adjustable shoulder straps. Full coverage apron for home or shop. Quick release belt fits waists up to 52 in. Steel double tongue roller buckle. Front cut down design for bending comfort. Made of top grain leather. Steel double tongue roller buckle. Front cut down design for bending comfort. Made of top grain leather. Four main nail/tool pockets, 6 smaller pockets fits pliers, nail sets and pencils. Steel hammer loops and metal clip holds all measuring tape sizes. Fits belts up to 2" wide. One main deep pocket, 2 front molded tool pockets, 2 tapered screwdriver holders. (1) Leather pocket fits up to 30' measuring tape. Tape chain and metal tool clip. Fits belts up to 2-3/4" wide. E4043 DC aluminum "AluminArc" specialty welding electrodes are the highest strength alloy for arc and torch welding of low alloy aluminum. Excellent for cast, wrought and extruded aluminum in all positions. Can also be used as a torch brazing alloy. Typical applications include truck beds, loading ramps and docks, banisters, stairs, diamond plate, irrigation piping, engine blocks, transmission housings and railroad frogs. Recommended Polarity: DC Reverse. Weight Lbs. (Kg): .5 (.22). Amperage: 70-120. Made of polyester fabric and ballistic nylon binding. 2 main pockets for tools/nail, 2 additional pockets and 6 small pockets for hand tools, pencils and nail sets. Pry bar or combination square holder. Heavy-duty double layer, lightweight fabric will not rot, crack, harden or mildew. Foam padding. 2" double tongue metal roller buckle. Grip strip fastening system hold pouches securely in place. Keeps fasteners, tools and other equipment close at hand for easy retrieval. The vertical storage design makes it ideal for holding taller tools, batteries and other items. Its heavy-duty construction holds up to regular use and is immune to rust so you can use it out in the rain. Quick connectors for #1 through #4 welding cable extensions. Heat and oil resistant covers. Rugged, lightweight ballistic poly fabric; innovative handle design for easy adjustment and carrying; 3 main nail and tool pockets; 7 smaller pockets for pliers, pencils, nail sets, etc. ; metal clip holds all measuring tape sizes; 2" wide web belt with single tongue roller buckle. Heavy-duty poly fabric construction provides strength and durability. The pouch has a main pocket with double pull zipper and small internal pockets provide multiple storage options. Small flap pocket with zipper to secure change, keys, or small phone, medium-sized pocket with hook and loop flap closure for added storage, clips onto pants or pockets or fits belt two inches wide. E6011 an all-position rod with strong arc force for deep penetration; fast metal solidification facilitates welding in vertical and overhead positions; light slag allows for easy clean-up; excellent for rusty steel because of the strong arc force; useful for galvanized tanks, steel casting and pressure pipe. Recommended polarity: AC, DCEP, DCEN (Either Polarity). Tensile Strength (PSI): 88,000. Amperage: 25-75 on sku #s (890.9665, 890.9673, 890.9681) Amperage: 35-125 on sku #s (890.9707, 890.9715, 890.9723) Amperage: 50-160. Heavy-duty poly fabric construction includes reinforced edges for extra wear. The pouch has a large main pocket and smaller front pocket for convenient access to parts or tools. Web loops and sleeve pockets provide multiple storage options, handy flashlight or large tool sleeve, electrical tape strap plus carabineer for keys. Rear clip or attach to belt up to 2-3/4" wide. Large, gusset-style pockets provide extra capacity and easy access, 5-main pockets and inner flat pocket for a variety of tools, nails and parts and steel loop hammer holder and tape measure clip. Pouch handle allows for simple belt adjustments, easy one-hand carrying and convenient on-hook storage, 2-inch wide web belt with double-tongue roller buckle helps keep belt stable. E6010 an all-purpose electrode used in all positions; a deep penetrating rod for carbon and galvanized steel; E6010 is for use with a DC welder and runs on DCEP; ideal for welding through light to medium amounts of dirt, rust or paint. Recommended Polarity: DCEP (Reverse Polarity). Tensile Strength (PSI): 80,000. Amperage: 35-125. Heavy-duty poly material cover with slip-resistant spine is durable and easy to carry; full zipper closure keeps loose articles secure; built-in calculator solar power keeps it ready for quick calculations; spring clip holds writing pad and notes in place; multiple pockets and sleeves for business cards, pens, and loose documents. Made of polyester fabric and ballistic nylon binding. 4 main nail and tool pockets, 2 small pockets and 4 large screwdriver holders. Electrical tape strap, metal measuring tape clip and tool snap. Made of heavy duty 1680D 2-ply poly fabric. The large capacity interior pouch includes a pocket for a speed square. Includes a heavy duty web hammer loop and a couple of exterior tool loop holders. Fits on most work belts. Reversed heavy-duty leather. Two large capacity main nail/tool pockets; 6 Smaller pockets fit pencils, nail sets, pliers, etc. Fits belts up to 2 3/4" wide; 2 Steel hammer loops. Quick connectors for #1 through #4 welding cable extensions. Heat and oil resistant covers. Rugged, lightweight ballistic poly fabric. Stay-open features on main pockets with curved bottom make grasping nails, fasteners or parts a breeze. 3 main pockets for tools and nails and 6 smaller pockets for hand tools, pencils and nail sets. Steel hammer holder and metal clip positioned for quick access and easy tool return to keep your motion uninterrupted. Heavy-duty 1680d 2-ply poly material. Reinforced diamond PVC bottom holds bag upright. Includes 2 in. web belt with monster grommets and fits up to a 52 in. waist. Three-way carrying system, belt, handle or shoulder strap (shoulder strap not included). Tape measure clip, carabineer, t-chain tape roll holder. Box-shaped design prevents tipping. 7" x 5-1/2" multi-compartment plastic tray included to organize small parts. Pockets for drill bits, tips and electrical tap strap. 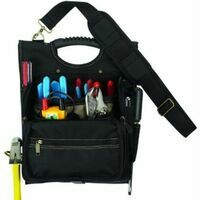 CLC Electrician's Tool Pouch, Zippered, 21 Pockets, Polyester Fabric, Black Cordura? Ballistic fabric. Barrel-bottom, super capacity pouch. Single body construction. Double layer pouch bottom. Speed square pocket. Heavy-duty web hammer loop. 3 vertical tool pockets. Adjustable, non-slip padded shoulder strap or remove to attach to belt. Steel loop hammer holder, snap hook and electrical tape web strap. Flat bottom design helps stabilize pouch when placed on level surfaces. Patented pouch handle allows for simple belt adjustments, easy one-hand carrying and convenient on-hook storage. 14 pockets, sleeves and loops designed to accept a variety of tools, testers, parts and connectors. Bag has a 14" open-top design with collapsible bar handle and is made of heavy duty poly fabric with base pads to protect bottom. Includes 16 exterior pockets, 10 interior pockets with 2 flap-covered pockets and one large zippered pocket for security, adjustable, non-slip padded shoulder strap and padded bar handle. 18 oz. Duckwear canvas; mesh shoulder and full mesh back to keep you cool; 14 pockets to hold tools, pencils and pens; 2 quick release removable, adjustable pockets; web hammer loop. 18 oz. Duckwear canvas; mesh shoulder and full mesh back to keep you cool; 14 pockets to hold tools, pencils and pens; 2 quick release removable, adjustable pockets; web hammer loop. LED light handle can be easily directed at work area or into tool carrier to help identify tools and parts; 3-levels of light output allow adjustment for wide area illumination or close-up work; ergonomic handle design helps reduce stress on hand and wrist; convenient open compartment for power tools and accessories; 22 multi-use pockets to help organize a wide variety of hand tools; padded, adjustable shoulder strap for easy carrying; base pad feet to help reduce wear and abrasion; powered by (2) AAA batteries, included. Features an impact resistant molded base that fully integrates with all PACKOUT? system components. Constructed with 1680D ballistic material and all metal hardware. Designed for ulitmate durability while the included padded shoulder strap and durable over molded handle allows for easy transport. Features an impact resistant molded base that fully integrates with all PACKOUT? system components. Constructed with 1680D ballistic material and all metal hardware. Designed for ulitmate durability while the included padded shoulder strap and durable over molded handle allows for easy transport. General purpose rod with medium to shallow penetration. Medium to heavy slag is easily removed. Excellent for poorly fitted joints. Smaller sizes of rod are well suited to low heat on thin metals. Use on all types of mild steel. Great for light gauge metal, sheet metal, duct work, etc. Recommended Polarity: AC, DCEP, DCEN (Either Polarity). Tensile Strength (PSI): 83,000 Amperage: 70-110. General purpose rod with medium to shallow penetration. Medium to heavy slag is easily removed. Excellent for poorly fitted joints. Smaller sizes of rod are well suited to low heat on thin metals. Use on all types of mild steel. Great for light gauge metal, sheet metal, duct work, etc. Recommended Polarity: AC, DCEP, DCEN (Either Polarity). Tensile Strength (PSI): 83,000 Amperage: 70-110. Produce quality results on smaller amperage AC/DC welders. Low hydrogen content reduces cracking and peeling of the weld material. Features excellent restart capability. Designed for welding low, medium and high carbon steels as well as some higher strength low alloy steel. For frames, trailer hitches and chassis. Recommended Polarity: AC, DCEN, DCEP (Either Polarity). Diameter (Inches): 5/32" Weight Lbs. (Kg): 5 (2.26) Tensile Strength (PSI): 84,000 Amperage: 140-190 Produce quality results on smaller amperage AC/DC welders. Low hydrogen content reduces cracking and peeling of the weld material. Features excellent restart capability. Designed for welding low, medium and high carbon steels as well as some higher strength low alloy steel. For frames, trailer hitches and chassis. Recommended Polarity: AC, DCEN, DCEP (Either Polarity). Diameter (Inches): 5/32" Weight Lbs. (Kg): 5 (2.26) Tensile Strength (PSI): 84,000 Amperage: 140-190 E6011 an all-position rod with strong arc force for deep penetration. Fast metal solidification facilities welding in vertical and overhead positions. Light slag allows for easy clean-up. Excellent for rusty steel because of the strong arc force. Useful for galvanized tanks, steel casting and pressure pipe. Recommended polarity: AC, DCEP, DCEN (Either Polarity). 1/8" Diameter, 22.7 Kg, 88,000 PSI tensile strength, 35-125 amperage.